The Treaty of San Francisco (サンフランシスコ講和条約, San-Furanshisuko kōwa-Jōyaku), Peace Treaty with Japan (日本国との平和条約, Nihon-koku to no Heiwa-Jōyaku) or commonly known as the Treaty of Peace with Japan, Peace Treaty of San Francisco, or San Francisco Peace Treaty), mostly between Japan and the Allied Powers, was officially signed by 49 nations on September 8, 1951, in San Francisco, California. It came into force on April 28, 1952 and officially ended the American-led Allied Occupation of Japan. According to Article 11 of the Treaty, Japan accepts the judgments of the International Military Tribunal for the Far East and of other Allied War Crimes Courts imposed on Japan both within and outside Japan. This treaty served to officially end Japan's position as an imperial power, to allocate compensation to Allied civilians and former prisoners of war who had suffered Japanese war crimes during World War II, and to end the Allied post-war occupation of Japan and return sovereignty to that nation. This treaty made extensive use of the United Nations Charter and the Universal Declaration of Human Rights to enunciate the Allies' goals. This treaty, along with the Security Treaty signed that same day, is said to mark the beginning of the San Francisco System; this term, coined by historian John W. Dower, signifies the effects of Japan's relationship with the United States and its role in the international arena as determined by these two treaties and is used to discuss the ways in which these effects have governed Japan's post-war history. This treaty also introduced the problem of the legal status of Taiwan due to its lack of specificity as to what country Taiwan was to be surrendered, and hence some supporters of Taiwan independence argue that sovereignty of Taiwan is still undetermined. Argentina, Australia, Belgium, Bolivia, Brazil, Cambodia, Canada, Ceylon, Chile, Colombia, Costa Rica, Cuba, Czechoslovakia, Dominican Republic, Ecuador, Egypt, El Salvador, Ethiopia, France, Greece, Guatemala, Haiti, Honduras, Indonesia, Iran, Iraq, Japan, Laos, Lebanon, Liberia, Luxembourg, Mexico, the Netherlands, New Zealand, Nicaragua, Norway, Pakistan, Panama, Paraguay, Peru, the Philippines, Poland, Saudi Arabia, South Africa, the Soviet Union, Syria, Turkey, the United Kingdom, the United States, Uruguay, Venezuela, and Vietnam attended the Conference. China was not invited due to disagreements on whether the established but defeated Republic of China (in Taiwan) or the newly formed People's Republic of China (in mainland China) represented the Chinese people. Burma, India, and Yugoslavia were invited, but did not participate; India considered certain provisions of the Treaty to constitute limitations on Japanese sovereignty and national independence. India signed a separate peace treaty, the Treaty of Peace Between Japan and India, for the purpose of giving Japan a proper position of honor and equality among the community of free nations, on June 9, 1952. As a consequence of U.K.–U.S. disagreement over Chinese participation, neither North nor South Korea was invited. Italy was not invited either, notwithstanding the fact that the government had issued a formal declaration of war to Japan on July 14, 1945, just a few weeks before the end of the war. Pakistan as a state had not existed at the time of the war but was invited anyway since it was a successor state to British India, a major combatant against Japan. Portugal was also not invited—even though its territory of East Timor had been invaded by Japan, disregarding Portugal's status as neutral country in the war. The Soviet Union took part in the San Francisco conference, and the Soviet delegation was led by the Soviet Deputy Foreign Minister Andrei Gromyko. From the start of the conference the Soviet Union expressed vigorous and vocal opposition to the draft treaty text prepared by the United States and the United Kingdom. The Soviet delegation made several unsuccessful procedural attempts to stall the proceedings. The Soviet Union's objections were detailed in a lengthy September 8, 1951 statement by Gromyko. The statement contained a number of Soviet Union's claims and assertions: that the treaty did not provide any guarantees against the rise of Japanese militarism; that China was not invited to participate despite being one of the main victims of the Japanese aggression; that the Soviet Union was not properly consulted when the treaty was being prepared; that the treaty sets up Japan as an American military base and draws Japan into a military coalition directed against the Soviet Union; that the treaty was in effect a separate peace treaty; that the draft treaty violated the rights of China to Taiwan and several other islands; that the draft treaty, in violation of the Yalta agreement, did not recognize the Soviet Union's sovereignty over South Sakhalin and the Kuril Islands; and other objections. It was not until October 19, 1956, that Japan and the Soviet Union signed a Joint Declaration ending the war and reestablishing diplomatic relations. The ongoing Chinese Civil War and thus the question of which Chinese government was legitimate presented a dilemma to conference organizers. The United States wanted to invite the Republic of China (ROC) on Taiwan to represent China, while the United Kingdom wished to invite the People's Republic of China (PRC) on mainland China as China's representative. As a compromise, neither government was invited. On August 15, 1951 and September 18, 1951 the PRC published statements denouncing the treaty, stating that it was illegal and should not be recognized. Besides their general exclusion from the negotiation process, the PRC claimed that Xisha (Paracel Islands), Nansha (Spratly Islands) and Dongsha (Pratas Islands) in the South China Sea were actually part of China. The treaty either did not address these islands, or in the case of the Pratas Islands turned them over to the United Nations. This treaty is as magnanimous as it is just to a defeated foe. We extend to Japan the hand of friendship and trust that with the closing of this chapter in the history of man, the last page of which we write today, and with the beginning of the new one, the first page of which we dictate tomorrow, her people and ours may march together to enjoy the full dignity of human life in peace and prosperity. Minister Jayewardene's speech was received with resounding applause. Afterwards, the New York Times stated, "The voice of free Asia, eloquent, melancholy and still strong with the lilt of an Oxford accent, dominated the Japanese peace treaty conference today." Of the 51 participating countries, 48 signed the treaty; Czechoslovakia, Poland and the Soviet Union refused. 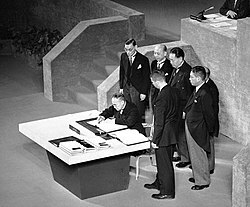 The signatories to the treaty were: Argentina, Australia, Belgium, Bolivia, Brazil, Cambodia, Canada, Ceylon, Chile, Colombia, Costa Rica, Cuba, Dominican Republic, Ecuador, Egypt, El Salvador, Ethiopia, France, Greece, Guatemala, Haiti, Honduras, Indonesia, Iran, Iraq, Laos, Lebanon, Liberia, Luxembourg, Mexico, the Netherlands, New Zealand, Nicaragua, Norway, Pakistan, Panama, Paraguay, Peru, Philippines, Saudi Arabia, South Africa, Syria, Turkey, the United Kingdom, the United States of America, Uruguay, Venezuela, Vietnam and Japan. The Philippines ratified the San Francisco Treaty on July 16, 1956, after the signing of a reparations agreement between both countries in May of that year. Indonesia did not ratify the San Francisco Peace Treaty. Instead, it signed with Japan a bilateral reparations agreement and peace treaty on January 20, 1958. A separate treaty, the Treaty of Taipei, formally known as the Sino-Japanese Peace Treaty, was signed in Taipei on April 28, 1952, between Japan and the ROC, just hours before the Treaty of San Francisco also went into effect on April 28. The apparent illogical order of the two treaties is due to the difference between time zones. Neither Korea nor its derivatives South Korea and North Korea was allowed to sign either the Treaty or a separate peace arrangement with Japan. Yoshida and members of the Japanese delegation sign the Treaty. According to the treaty's travaux préparatoires, a consensus existed among the states present at the San Francisco Peace Conference that, while the legal status of the island of Taiwan is temporarily undetermined, it would be resolved at a later time in accordance with the principles of peaceful settlement of disputes and self-determination, ideas that had been enshrined in the UN Charter. The document officially renounces Japan's treaty rights derived from the Boxer Protocol of 1901 and its rights to Korea, Formosa (Taiwan) and the Pescadores, Hong Kong (then a British colony), the Kuril Islands, the Spratly Islands, Antarctica and Sakhalin Island. Article 3 of the treaty left the Bonin Islands and the Ryukyu Islands, which included Okinawa and the Amami, Miyako and Yaeyama Islands groups, under a potential U.S. trusteeship. While the treaty suggested that these territories would become U.S. trusteeship, at the end that option was not pursued. The Amami Islands were eventually restored to Japan on December 25, 1953, as well as the Bonin Islands on April 5, 1968. In 1969 U.S.-Japan negotiations authorized the transfer of authority over the Ryūkyūs to Japan to be implemented in 1972. In 1972, the United States' "reversion" of the Ryūkyūs occurred along with the ceding of control over the nearby Senkaku Islands. Both the People's Republic of China (PRC) and the Republic of China (ROC) argue that this agreement did not determine the ultimate sovereignty of the Senkaku Islands. The Treaty of Taipei between Japan and the ROC recognized the terms of the San Francisco Treaty but added that all residents of Taiwan and the Pescadores were deemed as nationals of the ROC. Some supporters of Taiwan independence argue that the language in San Francisco Peace Treaty proves the notion that Taiwan is not a part of the Republic of China, for it does not explicitly state the sovereignty status of Taiwan after Japanese renunciation. In 1955, U.S. Secretary of State John Foster Dulles, co-author of San Francisco Peace Treaty, affirmed that the treaty ceded Taiwan to no one; that Japan "merely renounced sovereignty over Taiwan". Dulles said that America "cannot, therefore, admit that the disposition of Taiwan is merely an internal problem of China." This legal justification is rejected by both the PRC and ROC governments, both of which base their legal claims on Taiwan on the Instrument of Surrender of Japan which accepts the Potsdam Declaration and the Cairo Declaration. In addition, in more recent years supporters of Taiwan independence have more often relied on arguments based on self-determination as implied in the San Francisco Peace Treaty and popular sovereignty. By Article 11 Japan accepted the judgments of the International Military Tribunal for the Far East and of other Allied War Crimes Courts both within and outside Japan and agreed to carry out the sentences imposed thereby upon Japanese nationals imprisoned in Japan. The document further set guidelines for repatriation of Allied prisoners of war and renounces future military aggression under the guidelines set by the United Nations Charter. The document nullifies prior treaties and lays down the framework for Japan's current status of retaining a military that is purely defensive in nature. There is also some ambiguity as to over which islands Japan has renounced sovereignty. This has led to both the Kuril Islands dispute and the Senkaku Islands dispute. In accordance with Article 14 of the Treaty, Allied forces confiscated all assets owned by the Japanese government, firms, organization and private citizens, in all colonized or occupied countries except China, which was dealt with under Article 21. China repossessed all Japanese assets in Manchuria and Inner Mongolia, which included mineworks and railway infrastructure. Moreover, Article 4 of the treaty stated that "the disposition of property of Japan and of its nationals...and their claims...against the authorities presently administering such areas and the residents...shall be the subject of special arrangements between Japan and such authorities." Although Korea was not a signatory State of the Treaty, It was also entitled to the benefits of Article 4 by the provisions of Article 21. Total amount of Japanese overseas assets in China was US$18,758,600,000 in 1945 USD. As an expression of its desire to indemnify those members of the armed forces of the Allied Powers who suffered undue hardships while prisoners of war of Japan, Japan will transfer its assets and those of its nationals in countries which were neutral during the war, or which were at war with any of the Allied Powers, or, at its option, the equivalent of such assets, to the International Committee of the Red Cross which shall liquidate such assets and distribute the resultant fund to appropriate national agencies, for the benefit of former prisoners of war and their families on such basis as it may determine to be equitable. The categories of assets described in Article 14(a)2(II)(ii) through (v) of the present Treaty shall be excepted from transfer, as well as assets of Japanese natural persons not residents of Japan on the first coming into force of the Treaty. It is equally understood that the transfer provision of this Article has no application to the 19,770 shares in the Bank for International Settlements presently owned by Japanese financial institutions. Accordingly, Japan paid £4,500,000 to the Red Cross. Article 16 has served as a bar against subsequent lawsuits filed by former Allied prisoners of war against Japan. In 1998, a Tokyo court ruled against a suit brought by former Allied POW's, citing the San Francisco Treaty. It is recognized that Japan should pay reparations to the Allied Powers for the damage and suffering caused by it during the war. Nevertheless it is also recognized that the resources of Japan are not presently sufficient, if it is to maintain a viable economy, to make complete reparation for all such damage and suffering and at the same time meet its other obligations. Japan will promptly enter into negotiations with Allied Powers so desiring, whose present territories were occupied by Japanese forces and damaged by Japan, with a view to assisting to compensate those countries for the cost of repairing the damage done, by making available the services of the Japanese people in production, salvaging and other work for the Allied Powers in question. Accordingly, the Philippines and South Vietnam received compensation in 1956 and 1959, respectively. Burma and Indonesia were not original signatories, but they later signed bilateral treaties in accordance with Article 14 of the San Francisco Treaty. Japanese military yen issued by force in Hong Kong, Papua New Guinea, Philippines, Taiwan, and other places for the economic advantage of Japan were not honoured by them after the war. This caused much suffering, but the claims of the Hong Kong Reparation Association in 1993, in a Tokyo district court, failed in 1999. The court acknowledged the suffering of the Hong Kong people, but reasoned that the Government of Japan did not have specific laws concerning military yen compensation and that the United Kingdom was a signatory to the Treaty of San Francisco. Regarding China, on September 29, 1972, the Government of the People's Republic of China declared "that in the interest of the friendship between the Chinese and the Japanese peoples, it renounces its demand for war reparation from Japan" in article 5 of the Joint Communique of the Government of Japan and the Government of the People's Republic of China. The last payment was made to the Philippines on July 22, 1976. ^ a b "Treaty of Peace with Japan (including transcript with signatories: Source attributed : United Nations Treaty Series 1952 (reg. no. 1832), vol. 136, pp. 45–164.)". Taiwan Documents Project. Archived from the original on 2001-02-21. Retrieved 2008-11-13. ^ "Nehru and Non-alignment". P.V. Narasimha Rao. Mainstream Weekly. 2009-06-02. Retrieved 2009-10-31. ^ Singh, Manmohan (April 29, 2005). Dr. Manmohan Singh's banquet speech in honour of Japanese Prime Minister (Speech). New Delhi: Prime Minister's Office. Archived from the original on December 12, 2005. Retrieved March 28, 2014. ^ "The World at War - Diplomatic Timeline 1939-1945". worldatwar.net. Retrieved 2018-11-23. ^ "Japan Ministry of Foreign Affairs Compendium of Documents". Ministry of Foreign Affairs of Japan (in Japanese). Retrieved 2018-11-23. ^ "Foreign Minister Zhou Enlai's statement on the US-British draft peace treaty with Japan and the San Francisco Conference". ^ "A visionary strategist". Retrieved 20 January 2014. ^ "ADDRESS BY HIS EXCELLENCY J.R. JAYEWARDENE". Retrieved 21 April 2013. ^ "Japan-Sri Lanka BilateralRelations". Embassy of Japan in Sri Lanka. Retrieved 21 April 2013. ^ Kotelawala, Himal. "Forgotten Histories Of Lankan Leaders". Roar Reports. Retrieved 1 December 2017. ^ "FOUR ASIAN NATIONS SUPPORT DRAFT OF JAPANESE TREATY, CHALLENGE SOVIET CHARGES; U.S. POLICY BACKED Ceylon, Pakistan, Laos and Cambodia Stress Need of Just Peace INDIAN STAND IS OPPOSED 14 Criticisms of Document Offered Despite General Indication of Approval". Retrieved 6 October 2014. ^ Matsumura, Masahiro. "San Francisco Treaty and the South China Sea". The Japan Times. Retrieved 1 December 2017. ^ "Treaty of Peace between the Republic of China and Japan (Treaty of Taipei) 1952". USC U.S.-China. Retrieved 1 December 2017. ^ Chen, Lung-chu (2016). The U.S.-Taiwan-China Relationship in International Law and Policy. Oxford: Oxford University Press. p. 80. ISBN 0190601124. ^ 鄭裕文 (5 September 2011). "舊金山和約60年 台灣主權又起爭議". Washington, D.C. Voice of America. ^ "Court rejects H.K. residents' claims on military yen". Kyodo News. June 21, 1999. Retrieved May 14, 2012. ^ Ng Yat Hing (3 January 2006). "Letter to Prime Minister of Japan on 3 January 2006". Hong Kong Reparation Association. Archived from the original on 2012-11-20. Retrieved May 14, 2012. ^ "Joint Communique of the Government of Japan and the Government of the People's Republic of China". Ministry of Foreign Affairs of Japan. Retrieved 16 January 2016. Wikimedia Commons has media related to Treaty of San Francisco. This page was last edited on 20 February 2019, at 09:32 (UTC).